I get asked this question a LOT so I thought it was high time I wrote a blog post - Does Google know I exist? In this blog post I talk about how to tell and how to change that. Isn't that the same as Google Analytics? What shows up when you Google your own business name? Now, if you're not showing up when you Google your business name, it's almost certainly because you haven't told Google you exist. You need to submit your sitemap to Google Search Console and Bing Webmasters. This includes whenever you make significant changes to your site, such as creating new pages, changing your menu, then you need to tell Google about it. Fear not, I'm here to tell you what you need to do. Google Search Console is a free online tool provided by Google. It used to be called Webmaster Tools and can still be found at that URL. The main reason you need to know about this tool is to submit your website to be read by Google so it will send over its spiders they look at the menu, the pages and posts, and what they're looking for is if your website is useful, is it a quick website, is it all seamlessly linked together- how useful you are. And then it will know about all the pages and posts on your website. Google Search Console is needed because a) we need to tell Google we exist and b) we're human and we make mistakes. This handy free tool tells us where we've made mistakes and helps us fix them, and then helps us make sure our sites are as error-free as possible. Google Search Console vs Google Analytics? Google Search Console is different from Google Analytics but the two can connect smoothly. Analytics shows you a lot more information about how people are using your site, whereas Search Console shows you what people are searching for to find your site as well as tracking how your site shows up in search engine results. I'm so glad you asked. I've put together a PDF guide completely free with the step by step process on how to submit your sitemap to both Google AND Bing. Download it by clicking below! How do you let Google and Bing know about your website? You need to submit your sitemap. Wondering how to do that? Wonder no more! Download your copy of my free guide here! Yay! The download is on it's way. Add hello@business-shine.co.uk to your Contacts so I don't land in your Spam! Why should you hire a consultant for your business? Why is it that when we make the jump to be self-employed, we immediately assume the titles of marketing, HR, strategy, finance, as well as implementing the service / product delivery and expect ourselves to be expert at all of these things otherwise we are clearly failures? This is the same story I hear from clients time and time again and I call it a line of BS. Since I began my business I've hired consultants in the form of business coaches, mentors, web developers, accountants, virtual assistants, and so many more. Sometimes it's required a leap of faith (because oh my goodness, shouldn't I know this already?!) and sometimes it's been quite a simple choice, but I've always learned a lot and seen huge benefits in my business, and they haven't always been what I thought they might be. Sometimes these people can be called coaches, sometimes they're called consultants. I'm doing a course at the moment where the teacher says there's no difference between the two, they're all the same thing as the dictionary definition of a consultant is: "engaged in the business of giving expert advice to people working in a specific field". Have you ever considered hiring a consultant for your business? I know that when I invest in my business in this way, it's an investment in me and I know my clients feel the same way, but there's more to it than that, so I've shared four reasons why I see working 1:1 with an expert is beneficial to your business. "We have 100% got more bookings as a result of working with Maddy. We were getting bookings but rarely our target client and at a much lower rate. We have now increased our prices, so we are earning more from fewer bookings which is ideal and this year we were booked out by our target clients. We are earning approximately 30% more now as a result." It's incredibly powerful to have someone to stay accountable to when you're running your own business. Heavens know I've gone off on plenty of tangents only to come back to what I know works. Working together with an expert really gives a sense of purpose and motivation to do the work. I love checking in with fellow entrepreneurs but there can be a sense of wanting to put up a front to let everyone know you're doing ok, which is simply impossible to do with someone you're paying to speak to. By working 1:1 with a consultant, you know that you're going to get more bang for your buck when you stay accountable to what you intend to do that week. When clients work with me on my VIP program, we meet every 2-3 weeks, but they send me weekly updates with goals they've met and goals they plan to meet. One of the biggest qualities you get working with someone on a 1:1 basis is that you get support, and it's extremely important to me that I offer this to all my VIP clients. I am available for questions through the time we work together. You don't have to do this on your own, anymore! I aim to motivate and encourage my clients, just as I am motivated and encouraged by my own coach to do the work I feel passionate about. Working on your own, it can be lonely, and whilst your partner/significant other/WhatsApp group can cheer you on, they don't know your business like an expert does! An expert will be able to see things you just can't see around your business, the way you work and the way you promote yourself. I particularly focus on creating and developing a marketing and search engine optimisation strategy with my clients which can be so fun because it actually goes to show you how you can have fun with these supposedly dry topics! You need an expert in your life to say "Yes, that's how you do it and here's how you can do it even better." You don't want to spend hours doing this on your own when you could be spending that time with your loved ones. Did you identify with this? If you're feeling ready to step up your game as we head into 2019 and develop a marketing and SEO strategy with me, come and check out my VIP marketing program. Through a series of six calls we grow your business together through marketing and SEO. It's currently on special offer to celebrate the holidays at £2200 rather than the usual £2400. Book a discovery call here to see if we're a good fit. I'll be increasing the prices for 2019 so you best get in quickly! NOTE: You'll benefit the most from this program if you're not a newbie but rather if you have been in business for a while and you're ready to take that step up and invest in your business growth. Together we'll take your bookings to the next level (and have fun with it).This is your chance to see amazing results like these clients did. The sky is the limit, let's do this! 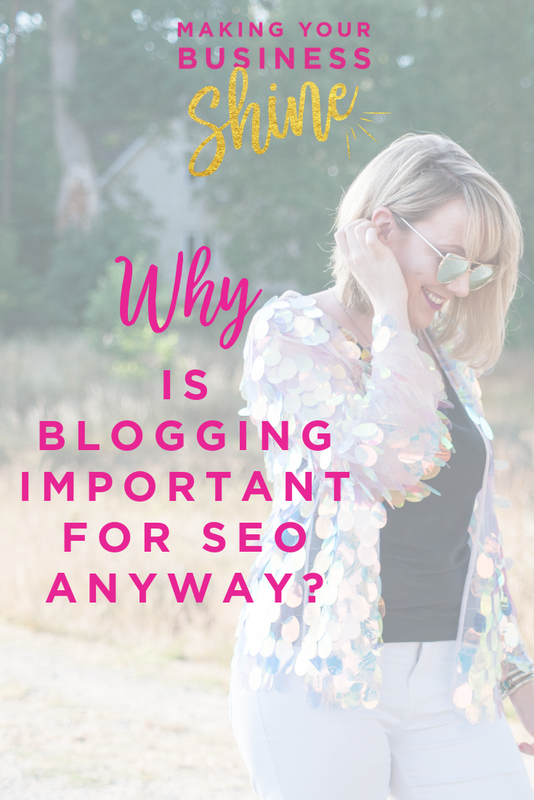 Why is blogging important for SEO anyway?! 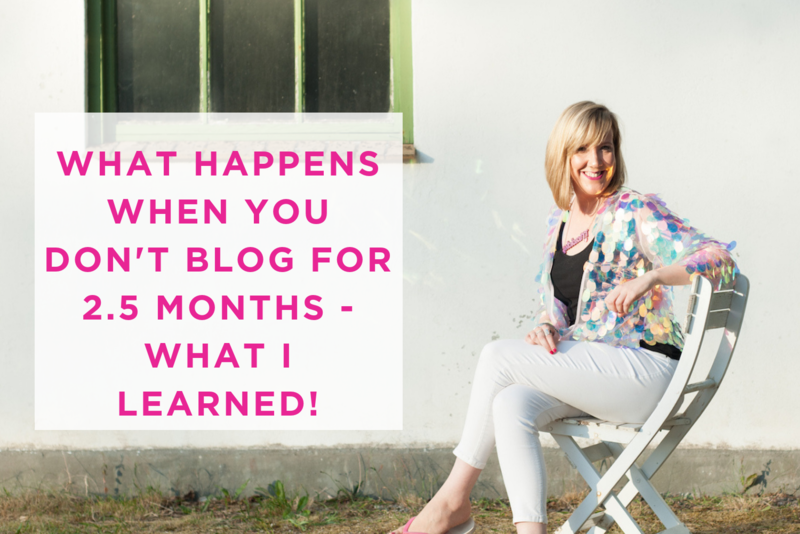 So, today I decided to share with you just how it helps specifically as I think it might help spur you on into blogging more often....! SEO is not stand alone. The first thing to note is that SEO is not a stand alone activity. It's not as cut and dried as that task is SEO related, that task is marketing related, it's ALL about driving traffic to your website. Once you have traffic on your website you then set up about converting that traffic into repeated traffic, and from there you have the opportunity to convert them into a sale. The next thing to note is you are probably not creating enough content in order to get your audience to remember you and to buy from you. I get a lot of questions about blogging. People wanting to make sure they do it right. Guess what? Most of those people are using these questions as reasons not to blog more often. Create more content to get found by your audience. You need to constantly remind people that you exist. The easiest way to do that? Create more content. What do you do with the blog posts? On my last blog post I talked about what I learned when I didn't blog for 2.5 months as an SEO expert - talk about putting your money where your mouth is! This attracted a LOT of traffic. It piqued people's interest. It sparked people's motivation. It jolted people into action. It got people talking. The key thing was I tracked all this on my Google Analytics. How did I get this traffic? I posted the link on my email newsletter, I shared the link on Facebook page, personal Facebook profile, Instagram bio, tweeted it. I shared it via private message with a few people in my network. I can see from Google Analytics that people were sending it to each other too. As a result, I watched my search engine rankings increase because more eyeballs were looking at my website. But hang on I hear you question...if I have blog posts already on my site, can't people just see them and that will work for me without me having to focus on that for a while? The short answer is nope. Remember what I said earlier - people want a reminder that you exist constantly. Therefore, search engines LOVE regularly updated websites. The easiest way to update a website? BLOGGING. This is because you're much more likely to actually write these rather than update your main website pages. You're much more likely to attract traffic if you post a link to a new blog post on social media. Every time you publish a piece of content online it creates a unique link. Search engines love websites full of juicy content with lots of pages and posts all linking to each other. Therefore, you need to create more unique links. Don't try to shortcut this. Don't get lost in creating hidden pages, black hat SEO techniques. Write more consistently on your blog. Publish the link to social media. There's much more to learn about SEO. SO much more. In fact I teach a whole course on this (are you on the waiting list?). But until you do this one thing of following my advice on blogging, you won't be able to grow your business and attract the enquiries you want. So what are you waiting for? What will you blog about next? Come and tell me in my free Facebook group So Exciting Obviously SEO for Creative Women. Today I want to talk to you about what happened with my SEO rankings when I stopped blogging. So here's what happened. Bearing in mind I kept up with all other marketing activities, still launched two rounds of my SEO course Let's Get You Found i.e. directing traffic to my site. My traffic plummeted. I had stopped giving people much reason to visit my website and therefore felt disappointed when they weren't engaging with what I had to sell. My enquiries dropped. This could be down to the fact that I now have a Facebook group where people can ask questions and learn from me right there, but also I think it's because I wasn't giving them a reason to visit my site because I wasn't blogging. Whenever I blog I get messages which warms up my audience and then leads to enquiries. My keyword rankings went down the toilet. I've enjoyed being page one for my search terms for a little while now and I must admit I got cocky. Be ye not so silly. I am no longer on page one for many of my keyword phrases and it's going to take a while to get back there. Just because you've carved out a niche for yourself doesn't mean you get to stay at the top! Many competitors have emerged since I started this business, plus, of course, the competitors who were there before me, I need to keep that in mind always! Now, I *could* have let the anxiety of this overwhelm me. However will I recover? What if people find out what a failure I am? I'm an SEO expert, I *should* be doing so much more. This was the perfect recipe for the panic attacks that used to frequent my life so much before. Indeed, the more I overthought about it, the less I wanted to blog. It's also the reason why I don't like to use the word 'should'. It adds unnecessary pressure which is unhelpful to all involved. I'm really good at hitting myself round the head with a metaphorical sh*tty stick and this has only ever increased since becoming 100% self-employed four years. Luckily I have a great support structure in place thanks to a relaxation technique I've been learning for the past seven years and counting. 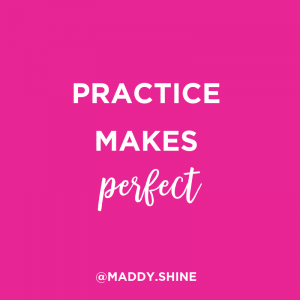 With this practice, I have a personal mentor and a business mentor and a worldwide community who all remind me I'm doing just fine and to focus on solutions and gratitude. With their support I can stay accountable to what I want to achieve, which is quite a bit. So why am I not just not hiding but actually blogging about it? Well it's because I care what happens to my site and it's SEO and I know you do too. That's why you're reading this. I see people complain about the fact that their traffic is rubbish but at the same time, they haven't made time to blog. They watch my free videos and go 'yeah but' and don't action them and still complain to me. I know this well because I've done it too! We all brush it off and push SEO to the bottom of our to-do list. Perhaps the biggest shameful confession is this: I have over 116 unpublished blog posts and many more titles and topics to write about in my head, on various notebooks. I became stuck and didn't know where to start. I wasn't taking my own advice. My favourite excuse that I happily shared with people was "I'm a perfectionist". This is not an excuse. 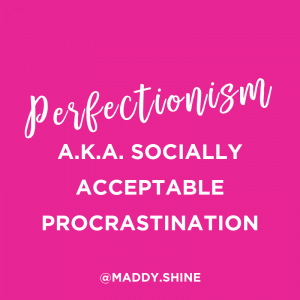 Perfectionism is socially acceptable procrastination. I was so busy ignoring my own advice that my business suffered. 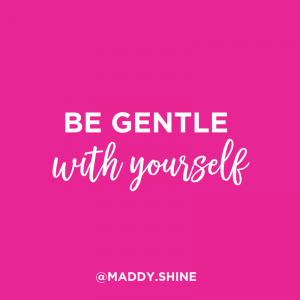 Don't get me wrong, I've booked in some wonderful students on my Let's Get You Found course, and I've been busy streamlining my services ready into head into 2019 with a bang, but at the end of the day, I just had to start. And now? My traffic is improving because of the blog posts, and I've already started to see changes in my rankings. I have more content for you to enjoy which makes you happy which makes me happy. I enjoy writing, and I intend to now write weekly. So I call out to you - who's with me? Who's going to commit to blogging weekly again? We can always find reasons not to do something. It's never too late to pick up and focus on the longer-term health of your business. 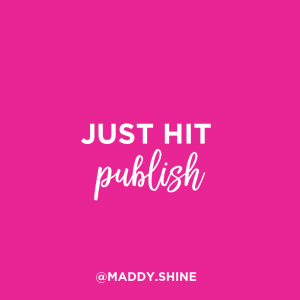 I know my life is made a lot easier when I just hit publish. P.P.S. See what I did? I referred to other pieces of content on my website within a blog post - this is a good thing for SEO and that's just one of the tips I talk about in my SEO for beginners guide available here.